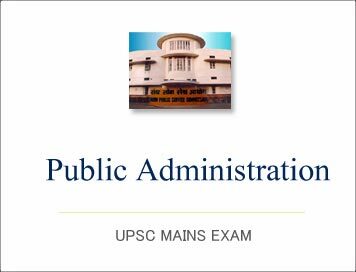 Public Administration Mains 2018 : Solved Paper Public Administration : Paper-2-Question-5 | IAS EXAM PORTAL - India's Largest Community for UPSC Exam Aspirants. ANSWER: One of the basic elements of our governance architecture is the presence of an impartial, honest, efficient and fearless civil service. The Civil Services in India still attract good talent. For this reason civil servants still do command respect from the public at large. The challenge before us is to change the role of civil servants in society, without diluting quality and commitment to national goals and concern for standards and retaining the regard of society. At the same time, the context in which all the civil services are functioning has also been changing. Rapid economic growth has led to a manifold increase in the quantum of work. Performance expectations have increased in terms of both speed and quality. The Government is no longer seen merely as a law enforcer or a controller of national resources. It is increasingly viewed as a provider - albeit an efficient provider - of basic services and public goods. People expect the Government to facilitate growth and development. In this context, civil servants have to shift from being controllers to facilitators and from being providers to enablers. They need to equip themselves with the necessary skills and capabilities to meet these new challenges. They need to master new technologies and new styles of functioning. ANSWER: Gender Budgeting is a powerful tool for achieving gender mainstreaming so as to ensure that benefits of development reach women as much as men. It is not an accounting exercise but an ongoing process of keeping a gender perspective in policy/ programme formulation. GB entails dissection of the Government budgets to establish its gender differential impacts and to ensure that gender commitments are translated in to budgetary commitments. The rationale for gender budgeting arises from recognition of the fact that national budgets impact men and women differently through the pattern of resource allocation. Women, constitute 48% of India’s population, but they lag behind men on many social indicators like health, education, economic opportunities, etc. Hence, they warrant special attention due to their vulnerability and lack of access to resources The way Government budgets allocate resources, has the potential to transform these gender inequalities. In view of this, Gender Budgeting, as a tool for achieving gender mainstreaming has been propagated.